This study is an attempt to approach the intellectual structure of the stem cell research field 2004–2009 through a comprehensive author co-citation analysis (ACA), and to contribute to a better understanding of a field that has been brought to the forefront of research, therapy and political and public debates, which, hopefully, will in turn better inform research and policy. Based on a nearly complete and clean dataset of stem cell literature compiled from PubMed and Scopus, and using automatic author disambiguation to further improve results, we perform an exclusive all-author ACA of the 200 top-ranked researchers of the field by fractional citation count. We find that, despite the theoretically highly interdisciplinary nature of the field, stem cell research has been dominated by a few central medical research areas—cancer and regenerative medicine of the brain, the blood, the skin, and the heart—and a core of cell biologists trying to understand the nature and the molecular biology of stem cells along with biotechnology researchers investigating the practical identification, isolation, creation, and culturing of stem cells. It is also remarkably self-contained, drawing only on a few related areas of cell biology. 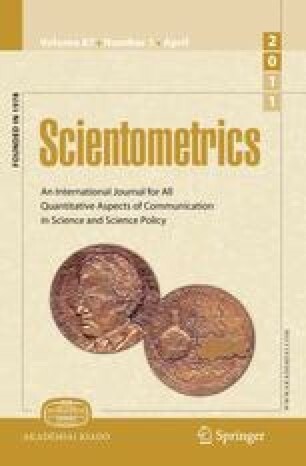 This study also serves as a baseline against which the effectiveness of a range of author-based bibliometric methods and indicators can be tested, especially when based on less comprehensive datasets using less optimal analysis methods. The online version of this article (doi: 10.1007/s11192-010-0317-2) contains supplementary material, which is available to authorized users. This study was funded in part by the Social Sciences and Humanities Research Council (SSHRC) of Canada and by Genome Canada. The authors would like to thank Gencheng Guo for his assistance in the data collection process. Department of Health and Human Services. (2001). Stem cells: Scientific progress and future research directions. Retrieved May 21, 2010 from http://stemcells.nih.gov/info/2001report/2001report/. Department of Health and Human Services. (2006). Regenerative medicine. Retrieved May 21, 2010 from http://stemcells.nih.gov/info/2006report/.